Be prepared to yell above the din of the restaurant to flag down a passing cart. You’ll also have to learn the less than subtle art of rejecting the carts toting things you don’t want; the pushcart aunties can be persistent. Some family favorites include: shrimp dumplings (xia jiao), turnip cake (lobo gao), pork dumplings (shu mai), glutinous rice with Chinese sausage (zongzi), bbq pork buns (cha siu bao), egg custard tarts (dan ta), fried sesame balls with lotus paste filling. One of the most popular dim sum places in Chinatown, Golden Unicorn offers the full dim sum experience: a crowded lobby where party numbers are called over a loud speaker, fast-wheeling food carts, and gaudily decorated rooms noisy with the sound of eating. Dim Sum Go Go is probably about as hip as it gets when it comes to dim sum, with its slick red signage and logo. Instead of carts, you order your dim sum selections from a comprehensive menu at the beginning. Try the special fried rice and the mango pudding is a must. 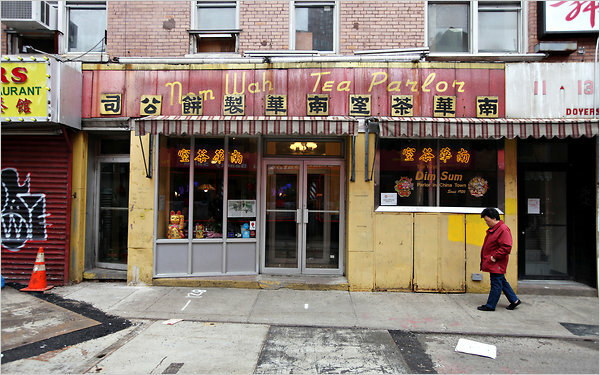 Nom Wah was the first dim sum restaurant opened in New York and has been in operation since 1920. Recently renovated by the Wilson Tang, who took over the business from his uncle, the restaurant is a cross between a 50s diner and a Chinese tea house–and eating there is certainly a nostalgic experience. Ping’s is a Chinatown staple and consistently serves fresh, delicious dim sum. Their seafood dishes are especially good. This diner sells dim sum to go, but ready to fight your way through the crowd and yell out dim sum orders in your loudest Cantonese.